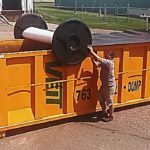 Dumpster container covers are an economical solution for keeping the contents of the container protected from the elements. 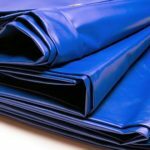 These high-grade PVC covers keep water, snow, and other environmental elements out. They also help contain noxious odors which may be present inside of the dumpster or container. Ideal for both permanent and Roll-Off Container Dumpsters. 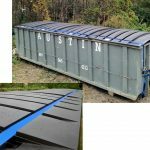 Choose from a solid PVC cover which is waterproof or a mesh cover which will allow ventilation into the dumpster. Mesh material will allow airflow into and out of your container. This material lets moisture escape the container to prevent condensation inside the bin.